Follow the lead of I Heart Bacon and Bacon Unwrapped and embrace your preference for pig by wearing a vintage Corner Cut Pork T-shirt. If it’s too much pork, Café Press also offers tees, sweatshirts, bags and aprons with other selections of meat and potatoes, including wafer cut fries, wild duck, and mutton. Prices range from $9 for a kid’s tee to $29 for a sweatshirt on Café Press. 1. Chocolate Tasting Class, La Maison du Chocolat will present a class on the production and composition of ganache, their filling of choice, as well as a tasting of the sweet, Thursday, June 29th, 6:30 p.m. to 8:00 p.m., at La Maison du Chocolat Boutique, 1018 Madison Avenue. $55/person (212.265.9404). 2. At the Table New York: Toasting Women Chefs and Restaurateurs , Sara Moulton of Gourmet magazine will host this five course dinner and auction to raise money for the scholarship and internship programs at Women Chefs and Restaurateurs, an organization started by some of the leading ladies in the restaurant industry to promote the advancement of women in the field. Featured chefs include Jody Williams of Gusto, Anita Lo of Annisa, and Amy Scherber of Amy's Bread, Thursday, June 29, 6:00 p.m. to 10:00 p.m., at the Prince George Ballroom, 15 East 27th Street. $150/person (877.927.7787). 3. Farm to Table: Happy 4th of July!, Learn how to make your own ketchup and mustard to go along with an Independence Day feast of Berkshire hot dogs and kale chips at Stone Barns, a farm and educational center in Westchester, Sunday, July 2, 11:00 a.m. to 1:00 p.m. or 2:00 p.m. to 4:00 p.m., at Stone Barns Center for Food and Agriculture, 630 Bedford Road, Mt. Pleasant. $25/person (914.366.6200 ext. 137). 4. Champagne Cruise, New York Water Taxi will pick you up at Pier 17 for champagne, a light meal, and front-row seats to the Macy's Fireworks Extravaganza, Tuesday, July 4th, 5:30 p.m. to 10:30 p.m., Pier 17, South Street Seaport. $125/person (212.742.1969). Summer outdoor entertaining holds many joys. Along with some minor dilemmas -- you don’t want to serve delicious seasonal meals on flimsy disposable plates, but you don’t want to risk your favorite breakables either. Jonathan Adler, the shining star of whimsical design, has come up with a solution. His Happy Home line now comes in durable acrylic and Melamine versions so you can use these relentlessly cheerful (as well as affordable) platters, pitchers, martini glasses and plates outside while staying cool and carefree. Other brands of plasticware do exist, but aren’t nearly as fun. $5 to $26 at Velocity Art and Design. Part cookbook and guidebook, Beth Elon's A Culinary Traveller in Tuscany is a collection of 10 road- and palate-tested itineraries that take the reader on a journey from the Lunigiana to the Maremma, with plenty of stops at markets, restaurants, bakeries, and gourmet shops along the way. Throughout, Elon shares recipes for more than 100 local and regional specialties. $15.72 at Amazon. Destination dining has always been a hallmark of the foodie. The extreme destination diner is the person who, say, plans a European vacation with the Michelin guide rather than a travel guide, who skips Venice entirely to spend two days in the Friuli back-country, in some town undistinguished by anything except its one-star restaurant famous for a stew of tender farm-raised rabbit. Or, in the case of New Yorkers, an extreme destination diner is someone who travels to a different borough. New Yorkers are tribal. They are obsessed with status symbols, and Neighborhood rivals Job as the Number One measure of status. They hate to cross from a more desirable neighborhood to a less desirable neighborhood, for any reason. And they especially hate to cross the rivers. And why should they—even the foodies? In a city of over 30,000 restaurants, you’re hardly ever going to have to go really far to get excellent food. Maybe for very specific ethnic food—Indo-Caribbean—you might travel to some ethnic enclave in an outer-borough. But otherwise why risk the social opprobrium? So New Yorkers destination dine for different reasons, reasons that, ironically, have little to do with the food. They’ll go out of their neighborhood’s way for a venue with buzz, of course. They’ll travel for a garden (rare in New York), or a view (even more rare). And if this garden or view is in an outer-borough, the Manhattanite will generally take car service to get there. I am, in fact, writing this post to announce that I have discovered the Best New Brunch Dining With a View in New York. But it takes a strange trip to get there, and you’re going to have to cross rivers, even highways. And you can’t take car service. I’m talking about the café at the new Fairway grocery store in Red Hook, Brooklyn, and you can’t take car service, because it’s just not acceptable when your brunch there will cost less than what you’d tip the driver. So you’re going to have to take public transportation, and as anyone knows who’s already been to Red Hook to check out its allegedly nascent dining scene, Red Hook is hugely out of the way. First, you’ll have to take the F train to Carroll Street, and then walk over the deafening traffic of the BQE. As you head toward the water, the two-story row houses give way to pot-holed streets lined with concrete warehouse buildings housing bus depots and industrial glass companies. There aren’t many cars and even fewer people. As you skirt the dirty lawns of the huge Red Hook West housing projects, you’ll notice there are lots of churches for some reason--lots of big churches. There’s space out here. 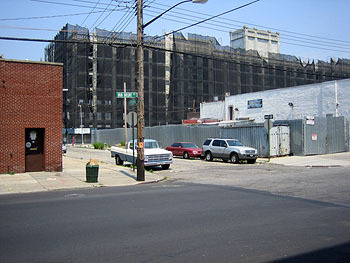 In the distance, just a few blocks away, the giant steel structures of the industrial waterfront loom as high as city buildings. It’s a disorienting mishmash of city genres. You feel like you’re far from New York, even though you catch expansive views of the Manhattan skyline which is only a fifteen-minute cab ride away, except that cabs don’t come to Red Hook. You soon hit Van Brunt Street, the main drag, where greasy bodegas alternate with blue-collar bars, a hipster diner, a patchy community garden, and rickety stand-alone houses. It’s scrappy and weird. All this, you think, for a grocery store? When you finally get to Fairway, at the very end of Van Brunt, you cross the big parking lot, and wend your way through the aisles of the sprawling store to get to the café in the back. It feels like the suburbs. You order a perfectly normal cream cheese and lox on a toasted everything bagel, or maybe the $3.95 scrambled eggs and ham from the grill, or an immense blueberry muffin from the pastry cabinet. Maybe a container of fruit salad. There’s nothing special on the menu here. 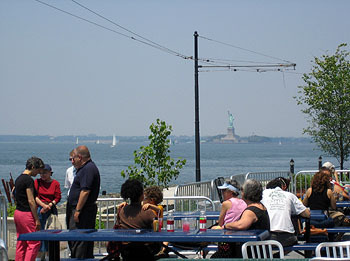 But then you walk through the open doors of the café to the patio in back of the grocery store, you pick one of a dozen picnic tables, and you take in one of the most spectacular views of the East River and the Statue of Liberty you’ve ever seen. It turns out Red Hook is the only part of New York City that, on land, has a full frontal view of the Statue. It also turns out that view is magnificent. The patio is surrounded on two sides by water, and it’s breezy and breathtaking as you bask in the sun and squint at the sparkling water. You watch the sailboats skit across the river and listen to the honk of the tugs. It smells like the sea and it feels like summer. You feel like you’re on vacation. You feel like this just might be the best everything bagel you’ve ever had. DESTINATION DINING A stroll along industrial Van Brunt Street (above) ends with a spectacular view from the new Fairway Market at Red Hook (at top). 1. The Aromatic & Edible Garden, Charles Day, the Garden Interpreter at Wave Hill, will lead a discussion and sampling of various relatives to ornamental onions, including garlic, chives, and leeks, on Wednesday, June 21, 6:30 p.m., at the Perkins Visitor Center at Wave Hill, West 249th Street and Independence Avenue, Bronx. Free with $4/person admission to grounds (718.549.3200). 2. Kitchen Secrets, New Yorker writer Bill Buford, joined by his mentor Mario Batali and chef/author Anthony Bourdain, will talk about his new book Heat: An Amateur's Adventures as a Kitchen Slave, Line Cook, Pasta Maker, and Apprentice to a Dante-Quoting Butcher in Tuscany, Wednesday, June 21, 7:00 p.m., at the New York Public Library's Celeste Bartos Forum, Fifth Avenue and 42nd Street. Free (212.930.0855). 3. Pair It Up, Pastryscoop.com will present a lecture on pairing cheese and wine, featuring Tim Solomon, assistant manager of Murray's Cheese, and Anthony Trincanello from Baron Francois wine, Thursday, June 22, 6:30 p.m., at the International Culinary Theater at the French Culinary Institute, 462 Broadway. $50 (plus a $2.50 service fee)/person (646.254.8542). 5. Beach Burger Bash, Join blogs A Hamburger Today and Gothamist as they flip burgers on Water Taxi Beach, including regional favorites like the Elk Burger from Idaho and the Missouri Guber Burger, which is smothered in smooth peanut butter. Stick around for a screening of George Motz's film Hamburger America, Saturday, June 24, 6 p.m., Water Taxi Beach, 2nd Street and Borden Avenue, Long Island City, Queens. Free admission ($16 for any four burgers, $9 for any two). The Food Section has its first-ever intern. Her name is Jane Lopes, and she's a senior English major at the University of Chicago. "I love Shakespeare, New York, and anything to do with food," she declares. Jane will be contributing to the Agenda event listings as well as a new summer feature coming soon to TFS. Welcome aboard, Jane!